In this article I will discuss the ski resorts, located near the city of Almaty especially as to reach them, the cost of accommodation, food and services in 2017. It is the oldest ski resort in the Republic of Kazakhstan, located in the city limits in the picturesque canyon of Zailiysky Alatau at an altitude of 2260 meters above sea level. The main advantage of this resort is its location in the city. If you go by car, you need to pass to the south of 13 km along the avenue Dostyk from Al-Farabi Avenue to the base station «Medeu» (Медеу). Next to the ski resort «Shymbulak» on the gondola cableway. If you go by public transport, you will need to get to the bus stop at the intersection of prospect Dostyk and street Kurmangazy (opposite the hotel Kazakhstan) bus stop can be found 600 meters away from the «Abay» metro station, then take the bus №12, in principle you can take the bus at any stop located on the route of the bus, bus runs daily from 7:00 am to 8:00 pm (every 30 minutes), by bus you need to get to the base station «Medeu». 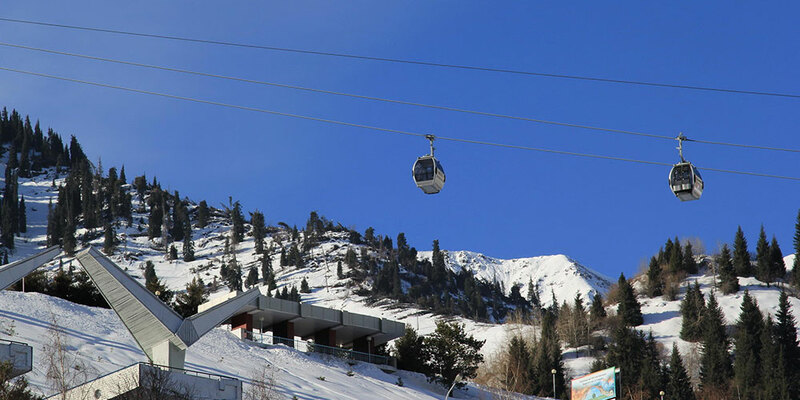 Next to the ski resort «Shymbulak», as the gondola cableway. There is also a possibility to order a transfer from/to the airport when you check into a hotel complex in the ski resort, the transfer cost (the minivan for 5 – 6 persons &plus; equipment) — 10 000 KZT (30 USD) in the one direction. You can stay in the hotel complex «Shymbulak Resort Hotel» or hotel–restaurant «S.N.e.G.», you have a choice of classes of rooms: standard, junior suite, family, family junior suite, luxe, deluxe and hostels. Area of hotel rooms begin from 9 square meters, the rooms are equipped with furniture, satellite TV, Wi-Fi, private bathroom with shower, toiletries and a mini-set of perfumery. Prices for a double room in a normal day starts from 24 000 KZT (70 USD) is per room for standard 120 000 KZT (350 USD) per day for a deluxe room. The room rate includes buffet breakfast, use of the sauna, parking, free internet in public areas, table tennis. The hostel provides accommodation in four–, six–bed rooms with bunk beds, with individual socket and lamp. Also you can use the common wardrobe and bathroom with shower. The cost of bed from 6 000 KZT (18 USD) per day. On the territory of Shymbulak are several cafes, restaurants and bars. Account per person average of 4 000 – 5 000 KZT (13 – 15 USD). On assurance of the administration, it is permitted to bring cooked food, utensils, microwave and refrigerator provided free of charge. Length of slopes for skiing over 20 km. Available tracks for all levels: green, blue, red, black. The highest point – Talgar Pass height of 3 180 meters above sea level. There are 7 lifts. The season runs from November to April. Working hours: from 9:00 am to 5:00 pm, night skiing from December 10 – Tuesday, Thursday and Saturday from 7:00 pm to 11:00 pm. Children under 10 years, students, pensioners (upon presentation of documents) — 2 500/3 000 KZT (7/9 USD). It includes a travel in both directions on the gondola cableway Medeu — Shymbulak. Rental of equipment — from 3 000 to 9 000 KZT (9 – 27 USD) per day. 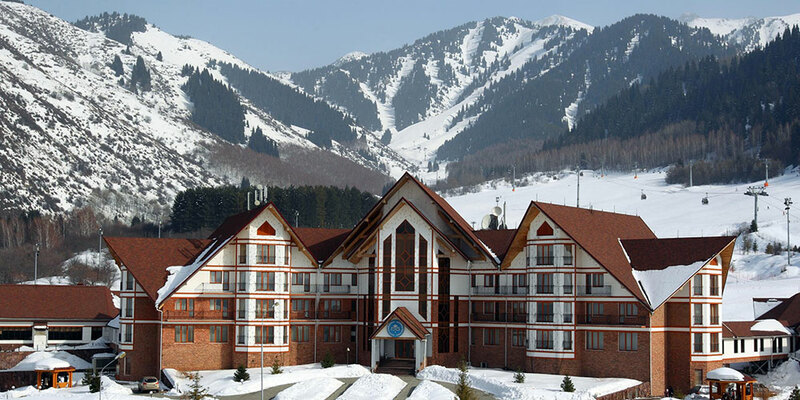 High mountain resort «Ak Bulak» is located in the Soldier canyon 40 km east of the city of Almaty. 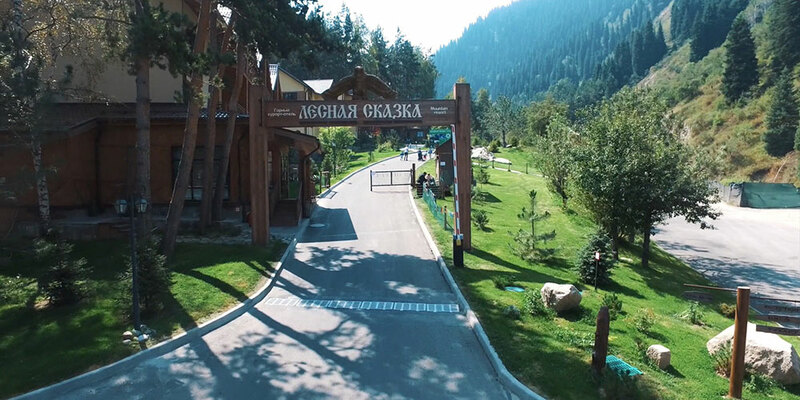 The advantages of the «Ak Bulak» include closeness to Almaty, length of trails and affordable cost of subscriptions. Public transport in the direction of the resort does not go, and there is no organized transfer. Get there from Almaty you can on the private transport or taxi for the 5 000 – 9 000 KZT (15 – 27 USD). More economical Talgar can be reached from Almaty on a passing taxi, taxi drivers that travel on this route, waiting for customers at the intersection of Pushkin street and Raiymbek prospect. Find car from Talgar to «Ak Bulak» is not difficult. 35 000 – 55 000 KZT (100 – 165 USD)— on holidays and weekends. Accommodation at the hotel of economy class starts from 9 000 KZT (27 USD) per person per day. The price of rooms at the hotel includes breakfast, sauna, swimming pool. Lunch and dinner can be ordered separately as a complex of 3 000 — 3 500 KZT (9 — 10 USD) per person. On-site restaurant of the same name, a café with a large selection of pizza and an outdoor area where you can enjoy barbecue and hot tea. Pricelist in the restaurant an average of 5 000 KZT (15 USD) per person. 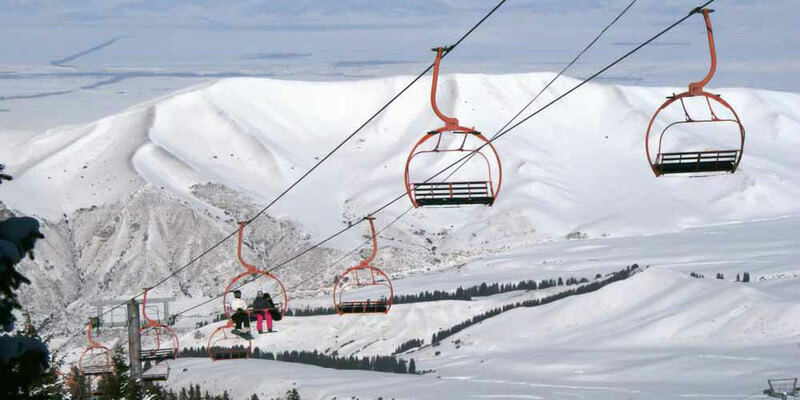 The slopes of the «Ak-Bulak» service 4 lifts: 2 chairlifts, 1 crance and one gondola lift, payment for elevators ranges from 300 to 1 000 KZT (1 — 3 USD) per person. 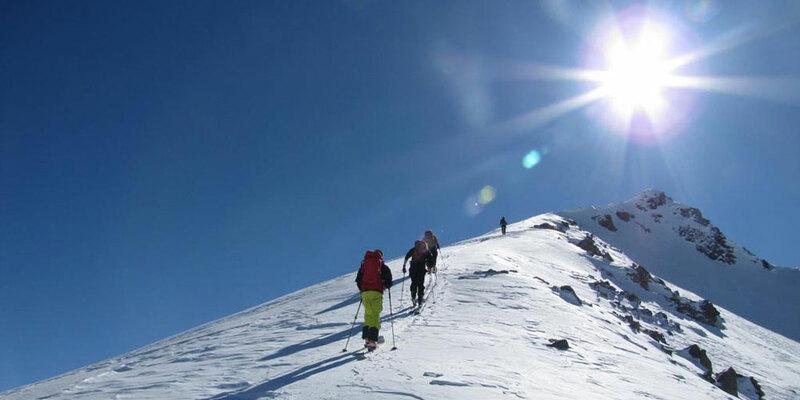 The total length of trails about 5 000 meters, there are both high and medium level of difficulty black and red, green simple and combined. The length of the main track is over 2 500 meters and lies amongst a picturesque forest. It is a combination — red level at the beginning and blue to outrun on training slopes. Working hours: from 10:00 am to 5:00 pm, night skiing from 7:00 pm to 10:00 pm (Friday — Sunday). Day ticket on weekdays will cost 4 900 KZT (14 USD), and 7 000 KZT (20 USD) over the weekend. You can also purchase a 4 – hour ski pass for the 3 200 KZT (9 USD) on weekdays and 5 000 KZT (15 USD) at the weekend. 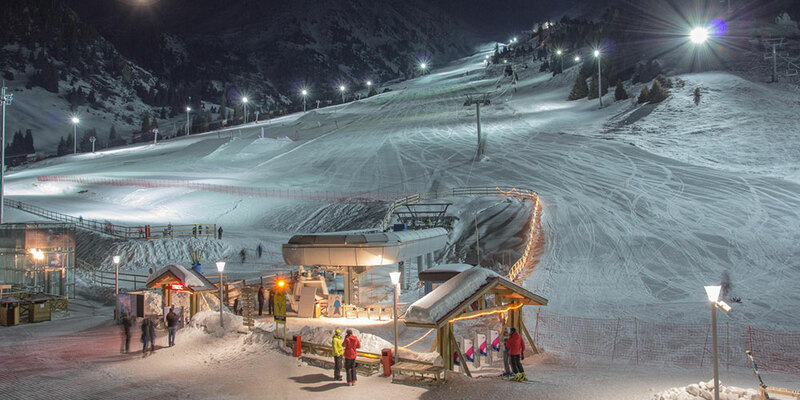 A ticket for night skiing on Fridays, Saturdays and Sundays from 7:00 pm to 10:00 pm costs 3 500 KZT (10 USD). 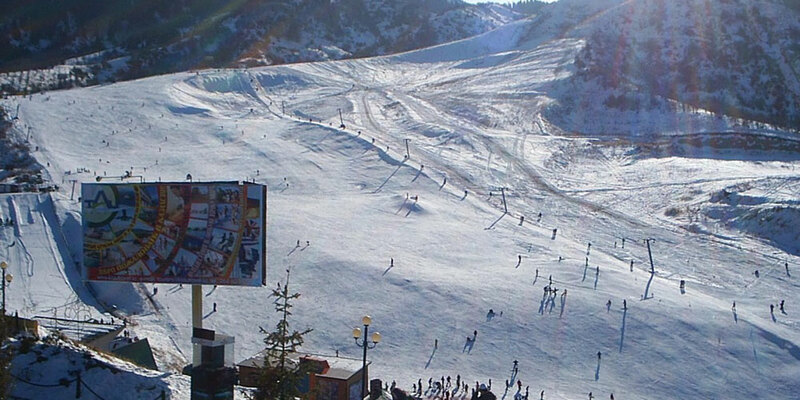 Ski pass for weekend (Saturday and Sunday from 10:00 am to 5:00 pm) costs 12 000 KZT (35 USD). Prices for ski rental equipment in the «Ak Bulak» is higher than in Almaty rental locations, and start from 5 000 KZT (15 USD) per set. Ski Park Pioneer mountain resort is a former ski resort «Almatau», which is located up the Talgar track, for settlement Besagash, Besqaynar and sanatorium «Tau Samal» at an altitude of 1 970 meters above sea level in a picturesque canyon Kotyrbulak in the Ile-Alatau National Park, Base Elik-Sai is almost here. Distance from Almaty city 25 km. The advantages of the resorts include the closeness to Almaty, a variety of trails, snow guaranteed availability and low cost. You can get there only by private car, paying the environmental fee at the entrance to canyon Kotyrbulak in the Ile-Alatau National Park. You can stay on the territory of resorts, cottages and private homes that the owners are willing to rent at a reasonable price. Room prices in the territory of resorts range from 5 000 to 25 000 KZT (15 – 75 USD) per day. The camp site Elik-Sai can only offer the standard heated rooms with facilities on the street, a tourist center Pioneer offers double, triple standard, junior suite and suites an area of 7 square meters. All rooms have amenities such as water, bathroom. The standard rooms have a bed and a wardrobe, shower room on the same floor, the junior suites and suites in addition to this – TV, kettle, shower, microwave. On the territory of the camp Elik-Sai no food points, so those who want to go here and have a rest, have to stock up on groceries and cook your own meals the camp has kitchen, gas, refrigerators for that. On the slopes of Ski Park Pioneer runs a small cafe, the average expense per person 2 000 KZT (6 USD). At Ski Park Pioneer is working rope tow length of 1 100 meters, which gives both skiers and snowboarders on the skillful height 1 970 meters above sea level. The route is preparing a snowcat, due to the location of the resort there are no problems with snow. The total length of trails about 2 km. Working hours from 10:00 am to 11:00 pm. 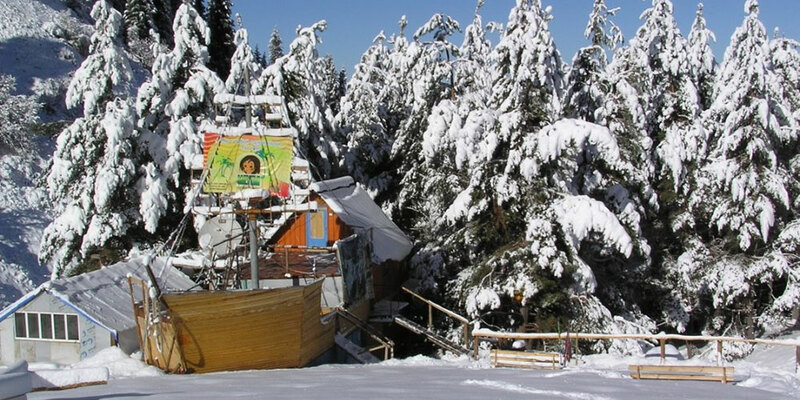 At the camp site Elik-Sai operates two ski lifts of the old type with a hook fastening. The total length of highways — 1 500 meters. Almost all black stripes, a high degree of complexity, it is a paradise for off– freeriding, there is one school descent. The highest point — 2 500 meters above sea level. Working hours from 9:00 am to 11:00 pm. Day ticket to the Ski Park Pioneer is 5 700 KZT (16 USD), and ski pass from 1.00 pm to 5.00 pm – 3 500 KZT (10 USD). 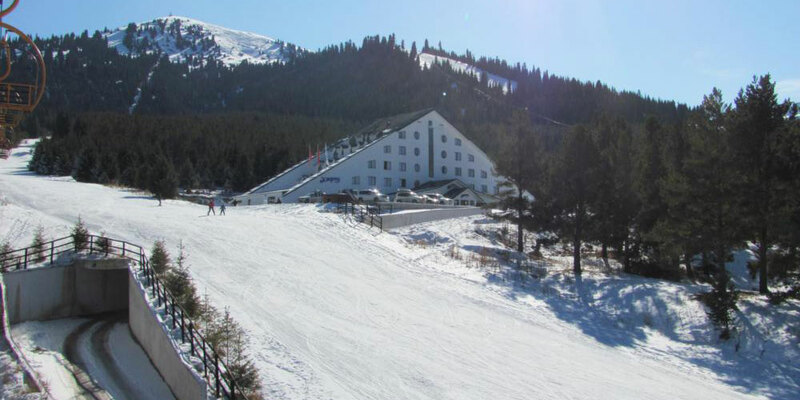 Ski pass for a full day in Elik-Sai is 2500 KZT (7 USD), from 14.30 ski pass cost is halved. 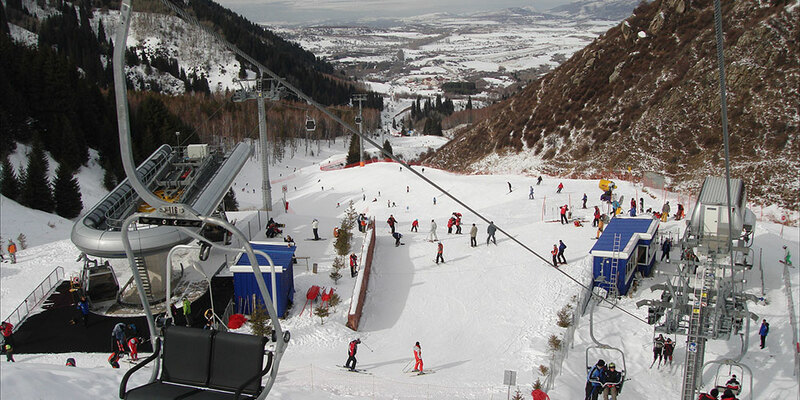 Rental mountain ski or snowboard will cost from 2 500 to 3 000 KZT (7 – 9 USD). The resort is located at the bottom of canyon Oh-Karagay Ile-Alatau National Park, 7 km from Besqaynar village 30 km from the city of Almaty. You can get there by taxi for 5 000 – 9 000 KZT (15 – 27 USD).Transfer is possible. 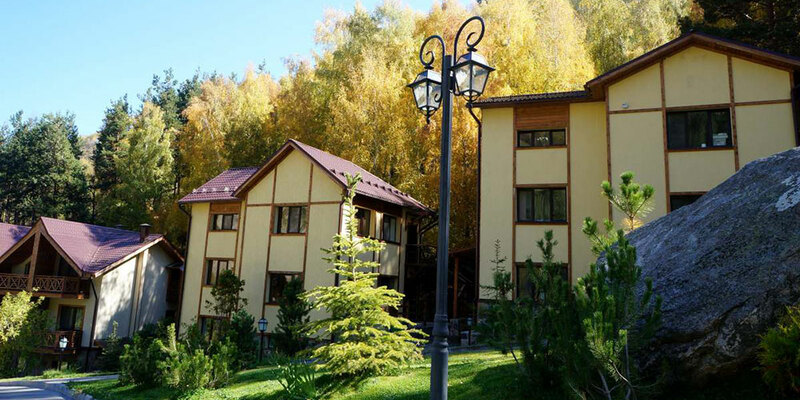 On the territory of «Lesnaya Skazka» are the mountain hotel and ethno hotel (yurt with all amenities), cottages, village on the trees and the VIP-chalet. Rooms are available with single and double beds. Each room is equipped with appliances, furniture, bathrooms with glass showers, baths and sinks. VIP-chalet – fireplace, sauna, comfortable lounges, large terraces, a kitchen, a private balcony. The price includes a breakfast. 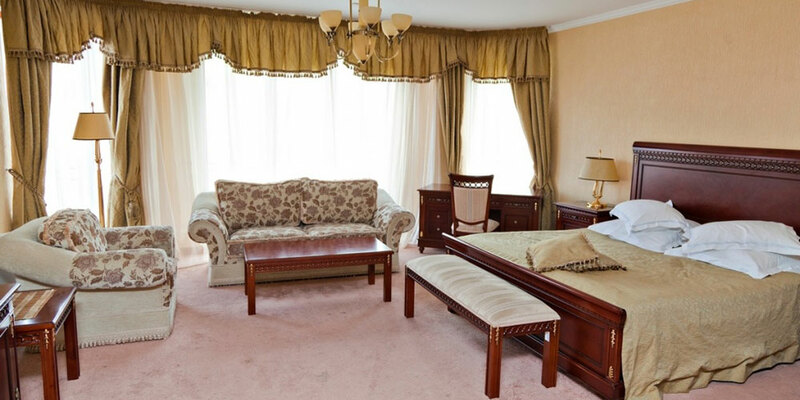 Prices of accommodation in double rooms within 25 000 – 60 000 KZT (70 – 170 USD) per day. 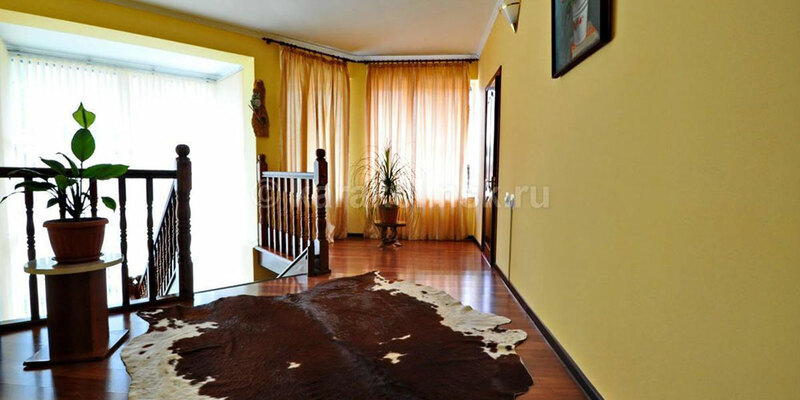 In the case of renting a whole cottage or chalet — 250 000 – 380 000 KZT (710 – 1010 USD) for 10 – 15 people. Meals at the resort can be in one of two restaurants (national Kazakh and Georgian cuisine), a family cafe and bistro. The average price tag per person 5 000 KZT (15 USD). The total length of the route of more than 800 meters. Suitable for beginners and children, as the slopes are very smooth. The resort is located at an altitude of 1 650 meters above sea level. Opening hours from 10:00 am to 9:00 pm. The cost of a lift is 200 KZT (1 USD) per person. The prices are the same during the week and weekend. Daily ticket from 9:00 am to 5:30 pm will cost 7 000 KZT (21 USD), ski-pass for 3 hours 3 600 KZT (10 USD). Rent ski equipment for the day from 9:00 am to 5:30 pm – 7 000 KZT (21 USD), 3 hours 3 600 KZT (10 USD). Unfortunately, at the present time, sports and entertainment complex for sale, so additional information will be after it will be decided the fate of this popular place among Almaty residents. 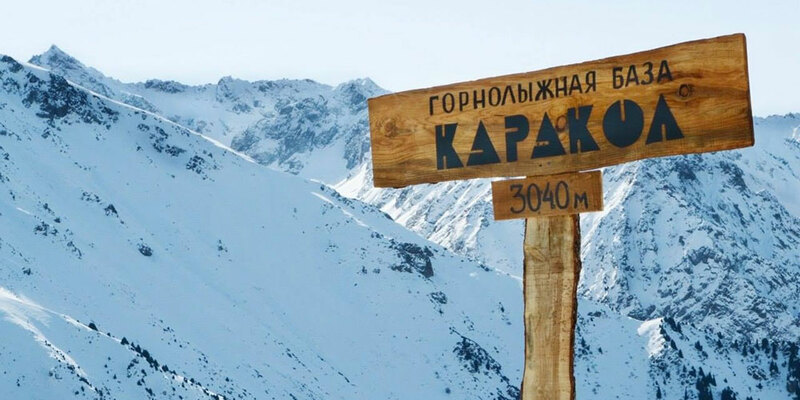 The most famous ski resort of neighboring Kyrgyzstan «Karakol» is located 7 km from the town of Karakol in Karakol canyon at the foot of Terskey-Ala-Too in the Issyk-Kul region. Distance from Almaty city about 380 km. Doubtless advantage of the winter vacation in Karakol that here finds something for everyone and features all the tourists. Novice skiers can take advantage of comfortable route and accessible services of the instructor. Experienced skiers off-piste skiing is available, and a variety of prepared tracks. From Almaty easiest way to get here by private transport or tour bus, which is organized on the eve of public holidays and weekends Almaty travel agencies. Transfer from Almaty to Karakol city is about 15 000 KZT (45 USD) in both directions. Number of private drivers working also on the route for 7 – 10 seater minibus for the price of 10 000 – 15 000 KZT (30 – 45 USD) per passenger. It takes an average of 9–12 hours, taking into account the state border. Thanks to the constant flow of tourists Karakol town infrastructure and the very ski resort offers excellent. On the slope there are three hotels housing, chalets and cottages. 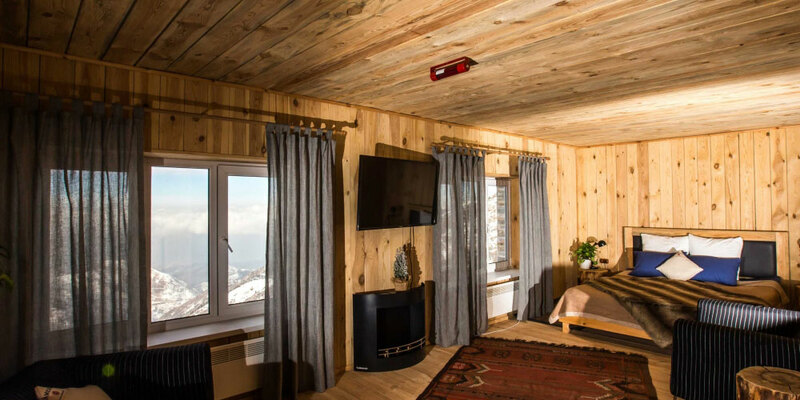 The price of living in close proximity to the ski lifts start from 60 USD per room per night. There is a possibility of accommodation on the basis of an all-inclusive: food, cable car and equipment rental, billiards, bar and fireplace. Meals price list about 30 USD per person per day. All standard rooms have an area of 15 square meters. There upholstered furniture, TV, bathroom, shower. The luxury apartments – two-car garage, necessary furniture, a pool table, TV, refrigerator, microwave, two bathrooms, shower. In a chalet suite, located in the forest, to guests available fireplaces, bars, sofas, TV with a big screen. 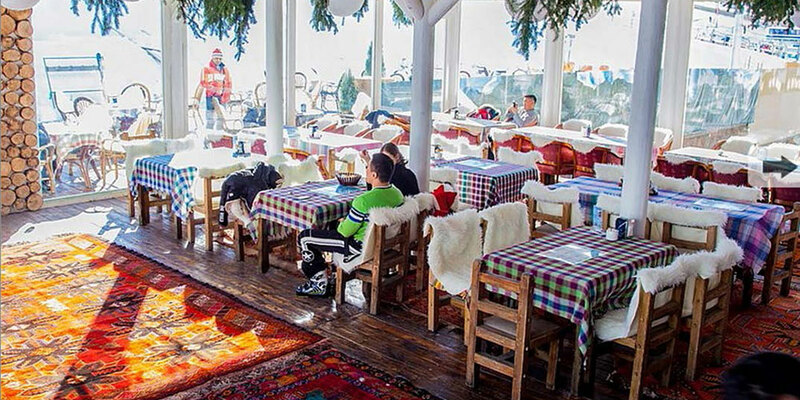 On the territory of the ski resort are 2 restaurants and 2 cafes. Also, tourists often stop in the town of Karakol, in numerous guest-houses and hotels cost from 15 USD. 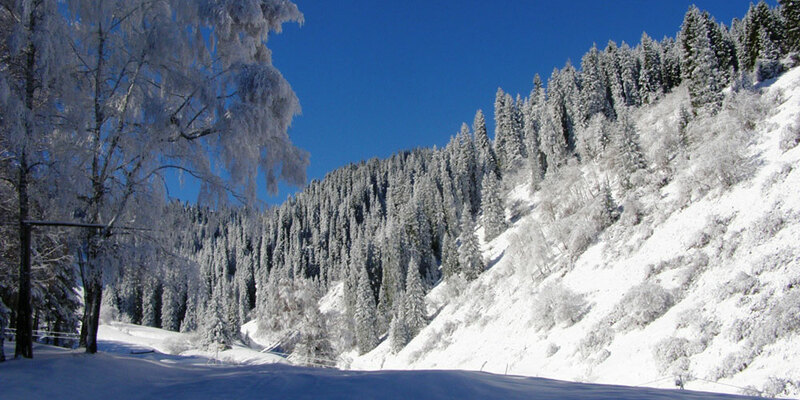 4 chairlifts service 20 km of Karakol trails. The length runs from 800 meters to 3 500 meters, with most of the slopes passes through a coniferous forest. The highest ski point — 3 040 meters from the peak of the «Panorama». Trails Karakol varied, here presented whole palette of slopes – from green for beginners to black sites where can go professionals. Adult ski-pass for a full day costs from 12 USD on weekdays and 17 USD on holidays and weekends. Children's ticket costs from 10 USD regardless of the day. Half-day ski pass at the weekend will cost 12 USD. Equipment rental cost depends on the quality and the year of skiing and snowboard, prices range from 5 – 15 USD. In conclusion I would like to note that the local sites selling discounts sometimes sells coupons for ski-pass in weekdays: www.chocolife.me, www.mirkuponov.kz, www.besmart.kz.